The final two weeks of 2017 saw preparations for the 2018 AFC U23 Championship kick off in earnest with the Olympic team traveling to Muscat to face their Omani counterparts in a doubleheader of friendlies. The young Fida'i will fly out today to Qatar where they will meet Al-Anabi on the 29th of December before heading to China for the the U23 Championship. 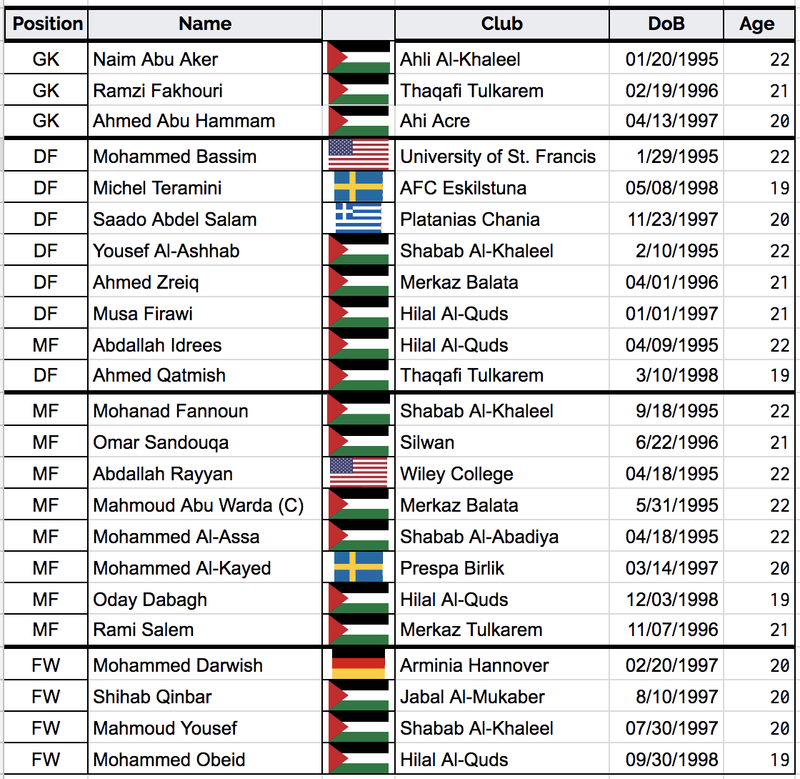 After a series of internal camps throughout October and November, Ayman Sandouqa settled on a final squad of 23 players- ten of whom are aged 20 or younger and thus able to compete at the 2020 Olympics should Palestine qualify. After playing a significant role in the qualifying phase Wadi Degla's Omar Jehad and VfB Lubeck's Abdullah Abou Rashed have not been included in the squad. Thaqafi Tulkarem's Abdel Karim Abu Shanab was injured during training in Doha and will not be with the squad. A similar fate befell the only Gaza-based player in the squad, Walid Abu Dan. Palestine's hopes in this tournament will be riding on their ability to improve on their showing during their qualification and for that many new faces that ply their trade abroad are with the team. There are four players who currently play outside of Palestine in the side- Mohammed Darwish is a Hannover 96 academy product whose goals won the German u19 Cup for Die Roten. He moved to crosstown rivals Arminia Hannover in search of playing time with the first team earlier this year. Also providing additional options in attack are Mohammed El-Kayed who was his team's top scorer notching 14 goals over the course of a 26 game season for KSF Prespa Birlik in the Swedish fourth tier. El-Kayed was recently on trial at AFC Eskilstuna and Michel Termanini (more on him below) informed Ayman Sandouqa of his quality. Abdallah Rayan- who plays collegiately in the United States for Wiley College has scored 21 goals in 26 games over the three seasons he has played at the school. Another player from the American collegiate system is Mohammed Bassim Rashid (henceforth known as Mohammed Bassim). The defender is a senior at the University of St. Francis just outside of Chicago and has been one of the best players on his team over the last four seasons. Despite being listed as a defender, he has played further up the pitch in midfield and led his team in goals with 11- contributing two assists to boot. The most important additions to the squad might very will be Michel Termanini and Saado Abdel Salam who will be counted on to form a partnership at the heart of the defence. Both Termanini and Abdel Salam have made their professional debuts in the European top flight (albeit for a combined 10 minutes) and their experience could prove invaluable in this tournament. Palestine have the second largest contingent of players playing abroad at this tournament (6) behind only Australia (8). Palestine's first friendly was against Oman and despite falling behind early from the penalty spot reports point to them being able to create a multitude of chances against a talented Omani side in a 1-0 loss. The second game later that week saw Palestine go one better and register a 1-1 draw courtesy of Mohammed El-Kayed's free kick. The Olympic side then jetted off to Qatar where they registered a 7-1 victory over a local club side (goals from Mohammed El-Kayed , Mohannad Fanoun, and Mohammed El-Assa). Ayman Sandouqa's charges ended their training camp on a positive note beating 2016 semifinalists Qatar by a 3-2 scoreline (goals from El-Kayed, Bassim, and Shihab Qinbar).